The screenplay and story seems like it was made by 10-year-old kid where none of it makes sense. It’s not even a fun movie. in fact, it’s a sour, gloomy, and death filled motion picture that’s not quite suitable for kids. It’s a weird direction they went here, none of it is worth your time, besides the visual effects, which are top notch on every level here. The video and audio presentations are demo worthy, 5-star elements to this Blu-ray release. It’s exactly what you want with this type of film and it exceeds expectations in every way. There are a ton of short bonus features, which are listed below as well. I just wish the film was better. In ‘Jurassic World: Fallen Kingdom‘ directed by J.A. Bayona (The Impossible, The Orphanage) and executive-produced by Jurassic titans Steven Spielberg and Colin Trevorrow, Owen (Pratt) and Claire (Howard) return to Isla Nublar three years after the destruction of the Jurassic World theme park to rescue any remaining dinosaurs on the island from a catastrophic volcano that threatens to leave dinosaurs extinct once again. 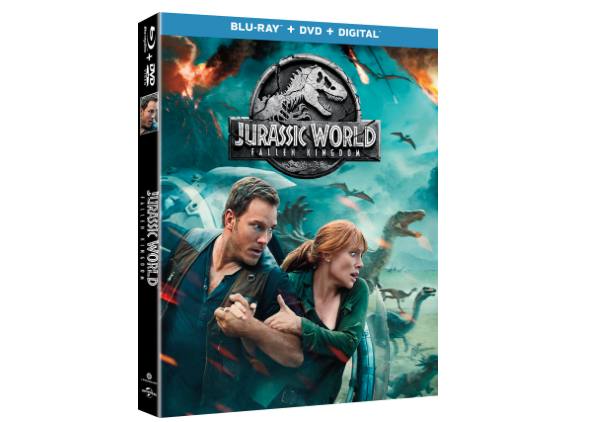 Owen is driven to save his lead raptor, Blue, while Claire makes it her mission to preserve the creatures that she has grown to deeply respect. When the lava begins to rain down, they soon discover terrifying new breeds of ferocious dinosaurs along with a conspiracy that could threaten the entire world. Joined by co-stars James Cromwell (Babe, The Green Mile) as wealthy entrepreneur Benjamin Lockwood, Dr. John Hammond’s partner in creating Jurassic Park, as well as Justice Smith (The Get Down) and Daniella Pineda (The Detour) as Franklin Webb and Zia Rodriguez, members of Claire’s Dinosaur Protection Group; this brilliant cast brings an extraordinary story to life as chaos erupts when Owen, Claire, and their team discover a most deadly endgame that could bring the planet back to prehistoric times. This entry was posted on Tuesday, October 2nd, 2018 at 2:57 pm	and is filed under Film, News, Podcast. You can follow any responses to this entry through the RSS 2.0 feed. You can skip to the end and leave a response. Pinging is currently not allowed. « Blu-ray Review: ‘Hocus Pocus’ 25th Anniversary!